The 1500 AD dates are (approximately) linked to the date that Christopher Columbus returned to the UK, initiating the Columbian plant exchanges. That is, they are arbitrary. E.J. Clement & M.C. Foster produced a book detailing these alien species called ''Alien plants of the British Isles', M.C. (1994). Another book also entitled 'Alien plants of the British Isles' was written by E.J. Clement, D.P.J. Smith & I.R. Thirlwell London (2005). There is yet another for alien grasses of the UK. To your Author, the 'Casual' status seems a strange addition to the Status of the plant, for surely the 'casual' definition may be applied to any of the other three status definitions, 'native', 'archaeophyte' and 'neophyte'. The status of many plants has not been unambiguously determined - they are plastic, controversial, subject to change, or unknown. Some wise botanists reduce the number of status states and may lump some aliens under 'Neophytes'. But your Author is not wise enough to do this all on his own, and is leaving them all as he found them under the WFS derivative of BSBI2007. In that the status of a great many plants is left totally blank. But another column suggests that they are either listed under 'Clement' or 'Yes' as aliens of some sort. So in those species which appear with a blank status in WFS's derivative of BSBI2007 will (in this tomb) appear under the 'Aliens' status, which is (probably?) what they are. To the Author it seems that plants in the 'Casual' status are mainly Aliens (of various degrees), but rather than your Author unilaterally group them under Clements' Aliens, he will let the user decide. The Author suggests the reader look under both categories (or search for 'status?aliens OR status?casual') for aliens of one sort or another. There is a lot of confusion as to the exact relationship between the various types of status, so Professor Clive Stace, an eminrent taxonomist, designed a simplified chart to clarify the already muddled situation, and I do hope he does not mind your Author reproducing a home-drawn version of his diagram here, since it explains a lot more than can easily be explained in words. Wild plants are split up into only 2 categories; native or alien. The alien species are sub-divided into either neophytes or archaeophytes (relatively recent introductions or much earlier introductions). NATIVE "A Native plant is one which has been growing in the area without being introduced by man usually for many thousands of years but could be from only last year if brought here naturally (not by man) but perhaps by a bird. It includes naturally occurring hybrids even if those have only recently been discovered." ALIEN "A plant which has migrated to the area either by humans (knowingly or accidentally) or without human aid from an area where the plant is or was an alien. Aliens can have arrived at any time since 6000 years ago in the Neolithic period." 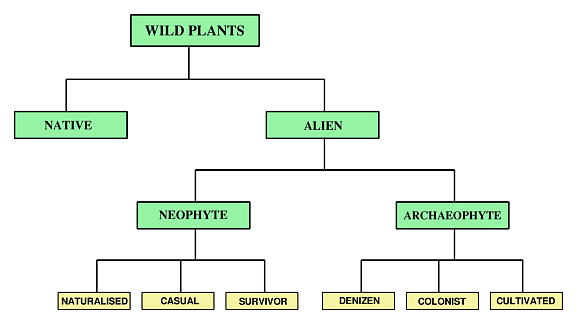 Neophytes: - An alien plant which arrived in wild state after 1500 AD/CE. Naturalised - after arriving it is able to integrate and propagate all by itself in a region other than its native region and has been so doing for over a number of years, some say a minimum of 25 years. Casual "A Casual alien is a plant which grows in an area without being planted but fails to establish itself in the wild for very long". Survivor (aka 'adventive' or 'waif') - Not self-reproducing each year, but repeatedly re-introduced (from seed or planted). Most in this category are woody, and especially are trees which cannot spread vegetatively and were deliberately planted, along roads, in parks, etc. Trees tend to last a long time - hence 'survivor'. Denizen - masquerading as a native but suspected of having been introduced either by design or accidentally. Colonist - a weed of cultivation by roads or houses and seldom found elsewhere. Cultivated - introduced by man either as a crop or accidentally within another crop, then escaping and persisting. [Note - It is thus obvious now that the category 'Casual' as used by your Author, is an odd one out since he does not categorise plants into any of the other 5 groups in the cream-coloured boxes. All those plants listed as 'Casual' should be re-labelled 'Neophyte' on this website. But whether your Author has the time to do this or to make all the (extensive) alterations necessary, is another matter]. 'WOOL ALIEN'. This refers not to an especially woolly alien version of a plant, but to an alien un-intentionally imported on wool (or presumably live sheep too). This seems not to be part of the 'Status' definition. However, Professor Stace himself makes extensive use of another term in his book 'New Flora of the British Isles', being 'Introduced-Naturalised' - which is presumably re-stating the 'Neophyte → naturalised' category in a slightly differing way(?). Even the term 'Native' itself is quite ambiguous and has several meanings. On a more general level, as used in this tomb, it is used as a term to indicate that the species occurs as a native somewhere in the UK. On a more specific level, a species may be native to one region of the UK, but not to another region or habitat. And on a plant by plant basis, any specific nominally 'native' plant may be native or planted even when it occurs in an area where it is also found natively. The reader could take the term 'native' onto an interplanetary basis - an organism could be native to Mars but not to Earth if ever life-forms are found on extra-terrestrial planets and accidentally brought back to Earth by returning astronauts. However, in this tomb, the Author uses the term 'native' in the general sense - it occurs somewhere in the UK natively. If the reader wishes to know where in the UK it grows natively, then please consult the BSBI or the NBN distribution map for the species in question. A full listing of all known Native, Archaeophyte, Neophyte and Casual plants is provided by the WildFlowerSociety which is derived from BSBI 2007 taxon data. This is the source of the status data used in this tome (Wild Flower Finder) too. N.B. Your Author has not yet discovered how to determine or find out the status of Mosses, Lichens, Moths, Butterflies, Mushrooms/Fungi or Liverworts, so many of these, for the moment, have a blank status icon, although your Author suspects that many are actually native.